The birth of a child brings great joy into the life of parents, siblings, grandparents, extended family and friends. The Baptism of that same child brings great joy into God’s Kingdoms both here on earth and in the Kingdom of Heaven. This is an important moment in the life of the child and his or her parents. As parents you are carrying out the “GREAT COMMISSION” Jesus gives us to make new disciples; you are also taking on the responsibility of passing on the Catholic faith to this new life. The Roman Catholic Church, in the form of this parish and its clergy, and staff, stand ready to assist you in this journey. This parish website covers the many ways in which we help form disciples, please take some time to get acquainted with all we have to offer. Go therefor, and make disciples of all nations, baptizing them in the name of the Father, Son and Holy Spirit, teaching them to observe all I have commanded them. And behold I will be with you until the end of time. Baptisms are held the first Sunday of each month at 1:00 p.m. in the Main Church. The Baptismal Font is a beautiful piece of ecclesial artwork and features a three level waterfall. In certain circumstances we are aware that the first of the month does not always fit the travelling needs of family and friends and so we do offer other dates for private baptisms. It is always preferential to have baptisms in a communal setting with other families, but we understand that certain circumstances may prevent this ideal. 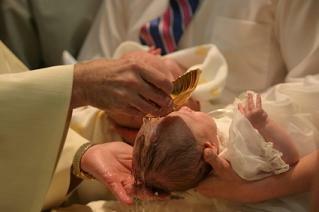 Prior to the date of the Baptism parents and Godparents are required to undertake a BAPTISM PREPERATION class. Parents will be asked to fill out paperwork to help facilitate the process. Godparents, both a man and a woman, who are practicing Catholics and who are baptized and confirmed, will be asked to obtain a sponsor letter from their parish priest which substantiates their qualification to be a Godparent. Monthly Baptisms normally include two to five infants being baptized and are normally an infant to two years of age, though sometimes children maybe slightly older. The Baptism rite normally lasts for forty-five minutes, and we offer many opportunities for pictures to be taken. Siblings are encouraged to take part in the Baptismal rite with some small gestures such a drying off the newborns crown after the baptism. The rite is performed in a very reverent and friendly manner and a family atmosphere is encouraged. In the case where an adult who has never been baptized would like to be baptized into the Catholic Faith, the Church offers a program entitled Rite of Christian Initiation (RCIA). For more information of the RCIA Program please visit that section of the site.